I had a fun day soldering new wires For TOMY James and Gordon Henry has other problems. For one his driving wheels have a crack in the main gear and a cut wire all 3 suffered the same problem only Henry has the crack. Both James and Gordon run well tho James did not want to start right away a jump from a rechargeable AA battery changed his mind. Well done Roblue, another set of trains saved from the trash. If you don't have a junk engine with the same type of clutched drive axle gear then you can do a little repair that might work. The clutch is not necessary if you aren't holding the engine in place while running. 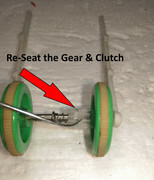 After re-seating the gear & clutch assembly, take some thin, liquid Super Glue (not any thick gel type) place a slight amount in the crack of the gear and in the split area where the clutch and gear meet. This will nullify the clutch but Henry may still work. Thank you Super, Gordon was my first attempt at soldering the area where his switch is is a little warped due to the iron sitting to long. But he still runs I am picking up 2 bulk lots one Today and Monday one looks to have a beat up Henry I hope to salvage his wheels. Whoa...you have a rare Amtrak in there too, great find. Well, I would say that the Amtrak and its two coaches are worth more than you paid both lots put together. Depending on its condition I would say $50 to $100 possibly more to an overseas buyer. It turns out I have most of the Amtrak Super Spiral Set a good bulk of of its there. $100+ just blows my mind I never knew that was in there let alone can go for that much and it runs. If I hold onto it will it go up or they stay about the same? And parts Henry is well going to be parts. Thank you! I think its all there besides the Station singe and a few window pains for the station its self. The bulk of it is looks to be there I have not gone threw it all yet. I Had posted this Thread in the TrackMaster Thomas and Friends section but seeing as how everything its TOMY I figured I would repost it here. I had a fun day soldering new wires For TOMY James and Gordon Henry has other problems. For one his driving wheels have a crack in the main gear and a cut wire all 3 suffered the same problem only Henry has the crack. Both James and Gordon run well tho James did not want to start right away a jump from a rechargeable AA battery changed his mind. Update: So my latest TOMY Thomas lot is a useful one a parts Henry I can use his drive wheels the rest is well parts someone tried to rewire him but failed. There was also the surprise find a rare Amtrak Super Spiral Set with the TOMY Amtrak Loco and cars!